This week my friend and I had the privilege to sample the new summer menu launched at Soho restaurant and club: 100 Wardour St. She really is an inspiration to all aspiring female chefs and women worldwide. 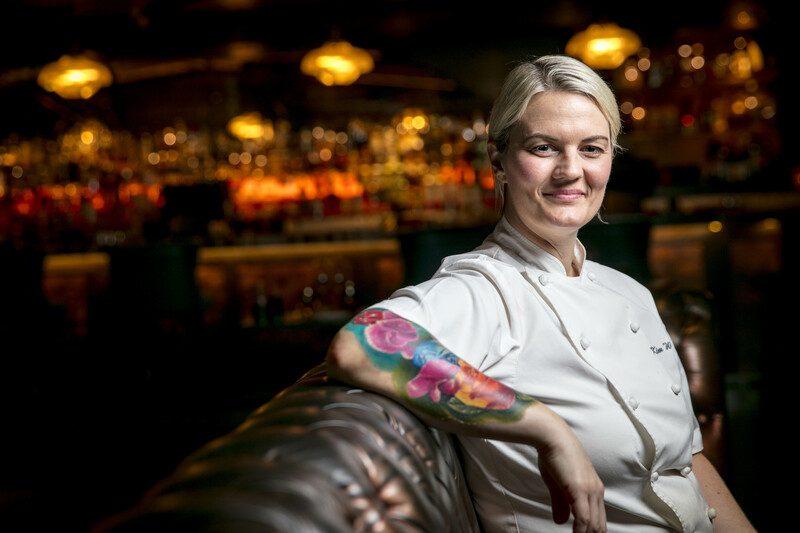 She has broken down gender barriers in her previous role as the first female chef at the Savoy Grill in its 126-year history, and now she has succeeded in establishing a name for herself in the typically male dominated environment of 100 Wardour St’s kitchen through the dishes she has introduced to revamp the menu this summer. Not only do Cheshire born Kim’s dishes exude her creative flair and passion for cooking through her varied and experimental ingredients, but also her eye for presentation and aesthetics as each dish is practically bursting with colour and arranged in such a way that the dishes are almost too good to eat! Her additions include some of the following: smoked fish dip, jalapenos, sesame seed crackers; cucumber, avocado and mint Gazpacho with a walnut crumble; beetroot risotto, pickled yellow beets, leaf garnishes and last but not least, everybody’s favourite: a sumptuously refreshing dessert of strawberry and rose Eton mess with pistachios. As a pescatarian and part time veggie, I am always extra critical of restaurants and expect their menu to cater for all dietary and lifestyle types as opposed to being meat heavy. Therefore, you can imagine I was delighted to see Kim’s impressive additions included gluten free and vegan options but with a modern, creative twist. Quite often restaurants resort to staple fish and veggie dishes such as salmon or cod options and vegetable tagines and simple pastas. However, Kim has ensured that her meat-free dishes are not compromised in terms of quality or taste; as I perused the menu it was evident that each dish contained an ingredient not frequently used by many restaurants and which subsequently meant her creations stood out from competing chefs. It also made it nearly impossible to select options from the menu as my friend and I positively wanted to devour everything! 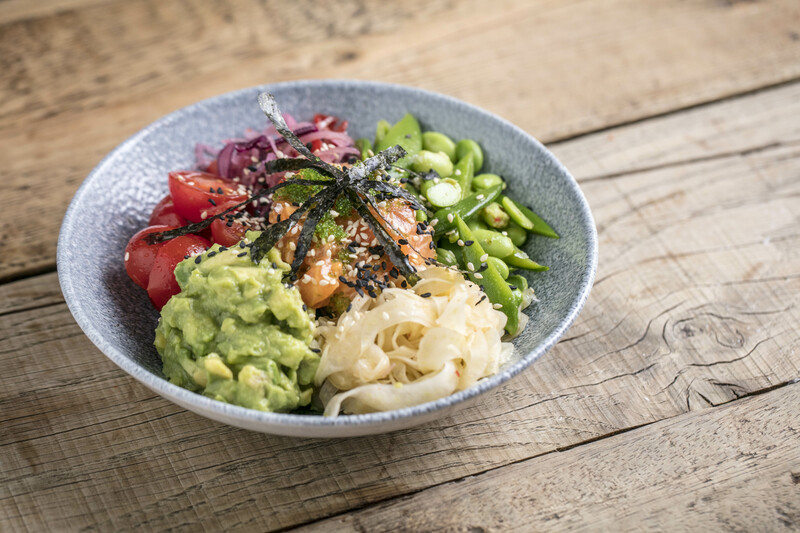 Salmon poke, avocado, Edamame, Nori, tomato and sesame Asian Slaw. After at least a half hour deliberation, I decided on the salmon poke, avocado, Edamame, Nori, tomato and sesame Asian Slaw combo to start. The eclectic mix of ingredients overwhelmed my tastebuds as each subtly worked its magic to leave my mouth watering. The Asian Slaw complimented the salmon perfectly and the sesame seeds really made the dish for me, pushing it over the edge and into the category of damn right delicious. The other ingredients such as tomato and avocado were so fresh and the perfect antidote to revitalise my wilting self in light of our current heatwave! My friend opted for the seared tuna, pickled radishes, mango and chilli salsa to start. Again she was overwhelmed by the multiple flavours that burst in her mouth and how soft the tuna fillet was, it practically melted in her mouth. For mains, I selected the harissa roasted aubergine, pistachio, rose, quinoa and tomato medley. The gentle dusting of spice spruced the aubergine up in ways I never thought possible and the pistachios and other assortments of seeds added a welcome crunchiness to combat the softness of other ingredients such as the juicy tomatoes. My friend chose the seared sea bream and seasonal vegetable coconut curry and was blown away by the generous helping of two fish fillets and the creamy sauce – she practically inhaled her dish and finished whilst I was still halfway through munching mine. 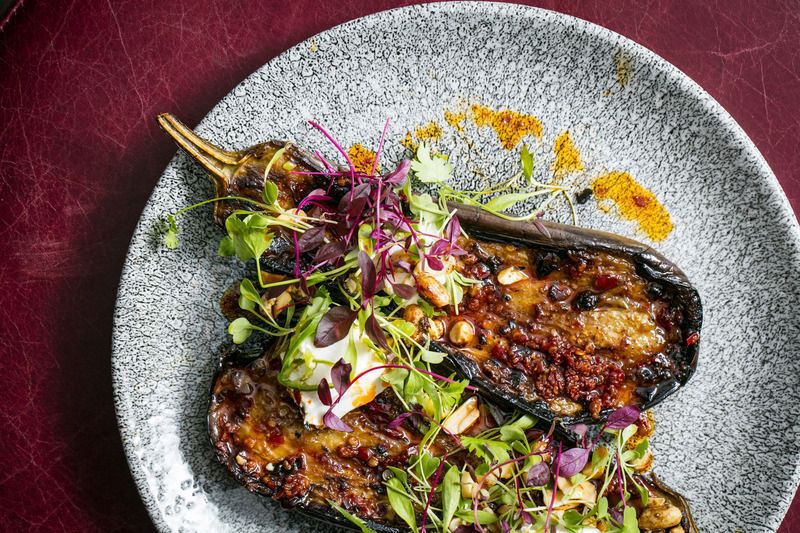 Harissa roasted aubergine, pistachio, rose, quinoa and tomato. Overall the new summer menu, thanks to Kim Woodward, has really revolutionised the concept of ‘Bar and Lounge’ food. This comes as no surprise after her appearances on MasterChef, The Professionals, BBC’s Great British Menu, Saturday Kitchen and ITV’s Yes Chef. We are very fortunate to have Kim gracing this London establishment with her wonderful creations. The prices were extremely reasonable, if not too reasonable- 100 Wardour St could have easily charged much more. You can expect top quality, variety and an extra large side dish of sophistication and class. The venue itself is visually stunning with dimmed lights and plush comfy chairs and sofas as seating; all the staff were welcoming and attentive. It really is fine dining that won’t break the bank.